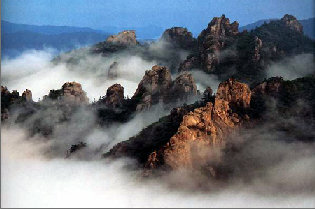 National Parks in South Korea are preserved parcels of public land, on which most forms of development are prohibited. They cover a total of 6.6% of the country's area, and are typically located in mountainous or coastal regions. Jirisan Park in the southwest is the country's largest mountain park. This was also the first Park to be designated in 1967. You will also find the largest natural wetland here, Upo Wetland which is home to more than 342 endangered species of flora and fauna. The largest marine park is Dadohae. It has an area of more than 2,200 km x km, but almost all of this is water. The smallest national park in South Korea is Wolchulsan, with an area of only 56.1 km x km. The parks here are overseen by the Korea National Parks Authority, established in 1987. The Authority operates its own police force, and since 1998 has been under the jurisdiction of the Ministry of Environment. It was previously under the jurisdiction of the Ministry of Construction. Korea has several dozen Designated and Provincial Parks and a rugged scenic coastline. The Gyeongju Park in South Korea features amongst the 20 best in the country. Hallyeohaesang Park is famous for Odongdo island full with plants of sub-tropical origin and beautiful camelias. Just north of the capital, the forests and cliff-top temples of Pukansan Parks offer great hiking and recreational facilities. Passes are an integral part of the hills and mountains and Hangyeryeong Pass spans the Taebaek Mountain Range where it serves as a commercial purpose as well as bring the tourist in droves with its scenic beauty. 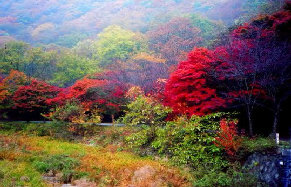 Three of the parks in South Korea, Soraksan, Odaesan and Juwangsan Park, are accessible from the East Coast highway. Soraksan National Park is widely considered to offer the most beautiful scenery in Korea with its rugged peaks, waterfalls, forests and temples. Similarly, Naejangsan Park is amazingly beautiful in the Fall for its lovely autumn leaves and Spring when the azaleas and cherry blossoms are in full bloom. Excellent tourist facilities range from exclusive 5 star hotels to budget hotels to hiking trails and campsites to the Osaek Spring luxury hot spring resorts. Rock climbers will enjoy the challenges of the Chiaksan area. Towards the center of the country, Songnisan Park in South Korea is another area renowned for its beauty. 50 km west of Taegu City is the Gayasan Park in South Korea, at the center of which is Haeinsa, Korea's best-known temple. Chirisan Park is known as a fine hiking and mountaineering destination. South of Seoul, South Korea's western area is known for its jagged scenic coastline and numerous National and Provincial Parks. Particularly notable is the Kyeryongsan Park which includes the two beautiful temples of Kapsa and Dongkaksa.